Before Oialla began harvesting the beans; the cocoa grew, ripened and rotted in the Bolivian jungle. No one really paid it any attention and only wildlife got to enjoy the sweet, white cocoa flesh. That all changed when the chocolatier Rasmus Bo Bojesen discovered the beans during a trip to Bolivia. He and his partner, Pernille Lützhøft, immediately recognized the enormous quality and potential. And through a partnership with a local cocoa company and the Ministry of Foreign Affairs in Denmark, they started making organic Beniano chocolate. This they named Oialla. Experience Oialla’s journey from wild bean to luxurious chocolate. 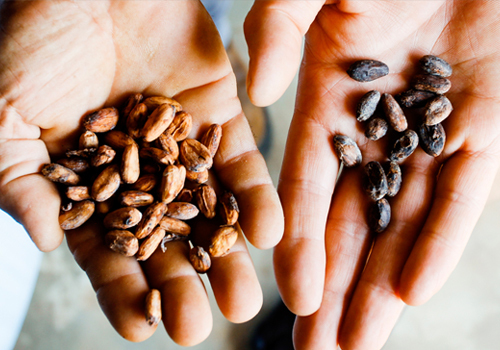 Join journalist Rowan Jacobsen on an adventure into the Bolivian jungle in search of wild cocoa. Approximately 80% of all chocolate is made with Forastero cocoa which mainly grow in African plantations. Forastero produces a bigger fruit and is therefore easier and more efficient to handle. Trinitario is a natural hybrid between Criollo and Forastero. Roughly 15% of the world’s chocolate is based on Trinitario. Criollo beans represents 5% of the world’s production and are notoriously difficult to grow as they are vulnerable to environmental changes and moreover yield lower quantities of cocoa. Beniano cocoa is closely related to Criollo. Cacao beans are healthy. Precisely how healthy you can read in this article that also describes the Super Fruit terminology. Bolivia lies in the middle of South America, completely landlocked. The country is divided into two extremes – the highlands of the Andes and the lowland jungle. The northern province, Beni, lies partly in Amazonia. Beni is divided into eigth counties (Mamoré, Vaca Diaz, Itenez, Moxos, Maruam, Yacuma, Ballivian and Cercado) and contains the capital city, Trinidad. It is in Itenez that the cocoa trees grow wild. Itenez is divided into three municipalities: Baures, Huacaraje and Magdalena. Baures is the largest and contains 67 islets in the dry season, which become small islands in the rainy season. This is where the cocoa trees can be found growing wild. So far we have visited six islands – San Carlos, San Pedrito, Santa Maria, San Lucius, Veremos and Caricuara. Currently around ten of the islets are being harvested. The Amazon jungle is situated in Bolivia’s north-eastern province of Beni where the wild cocoa trees are growing. To travel to Beni from Scandinavia you have to take five flights, spend one day of canoeing on the beautiful dark jungle river with jumping pink dolphins, howling monkeys and richly coloured parrots, then walk fifteen kilometers through mud to reach the trees that grow on islets in the mangrove swamp. New cacao types with unique flavours have been identified by Agricultural Research Service scientists on a collecting trip to Peru.